In the Chinese culture, noodles are traditionally eaten on festive occasions like birthdays and Chinese New Year because noodles symbolize good fortune, prosperity, and longevity. 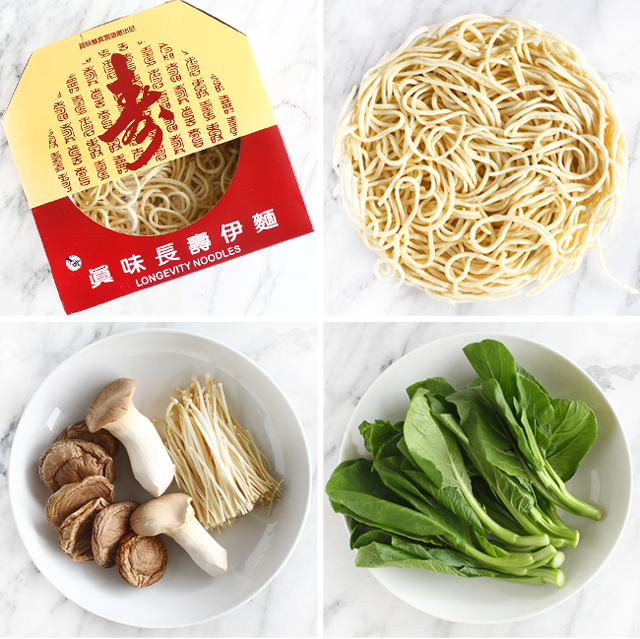 The ideal type of noodles for these occasions are long life noodles or longevity noodles (伊面) also known as yi mein or e-fu noodles. 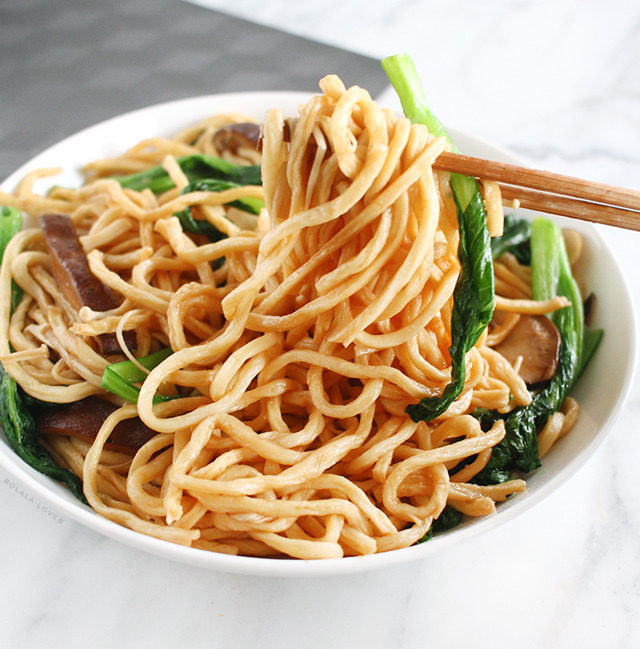 These are one of our favorite types of noodles. I cook them for special occasions but I also make them when we just feel like having them cause that's how we roll. This dish is commonly made with crab meat or vegetarian style at restaurants. I prefer the vegetarian version since we don't eat shellfish (hubster is allergic and I don't like it) and it's perfect for our vegetarian days. I developed this dish based on the restaurant dish served with black mushrooms and choy sum. Since we have it as a main, I added two more types of mushrooms for texture and flavor. It works well this way but you can also add a protein if you're so inclined. I like keeping it simple with my cooking and this dish is just that. It's also light and healthy and the leftovers are just as good the next day. This recipe is also adaptable and can easily be made vegan. All of the ingredients can be easily found in Asian markets. Long life noodles have a unique texture and mouth feel to them but if you can't get ahold of them, fresh Shanghai noodles or lo mein noodles can be substituted. And garlic chives are a wonderful alternative to choy sum also known as Chinese mustard greens. Bok choy works well too. 1. Cover the dried mushrooms with hot water in a bowl and let stand for 20 minutes to rehydrate. Drain the mushrooms, reserving 1 cup of the soaking liquid. Slice the mushrooms into 1/4-inch-thick strips. 2. Clean and trim the enoki mushrooms and separate. 3. Clean and trim the king mushrooms and slice into bit size pieces. 4. Wash and clean choy sum and drain. 5. Cook noodles according to package directions. Rinse with cold water. Drain well and set aside. 6. Combine and mix soy sauce, dark soy sauce, soy paste, oyster sauce, sesame oil, Shaoxing rice wine, water and white pepper. 7. Heat pan until hot, add 1 tablespoon of oil. Add the mushrooms starting with the king mushrooms, shitake and enoki. Add a drizzle of the seasoning mixture and stir fry until cooked. Take out and set aside. 8. Add 2 tablespoons of oil and place the choy sum vegetables in when pot is hot along with a drizzle of the seasoning mixture. Stir fry until fully cooked. Take out and set aside. 9. Place the noodles in the pan (no oil necessary) and stir around to loosen and warm them up for a minute or so. 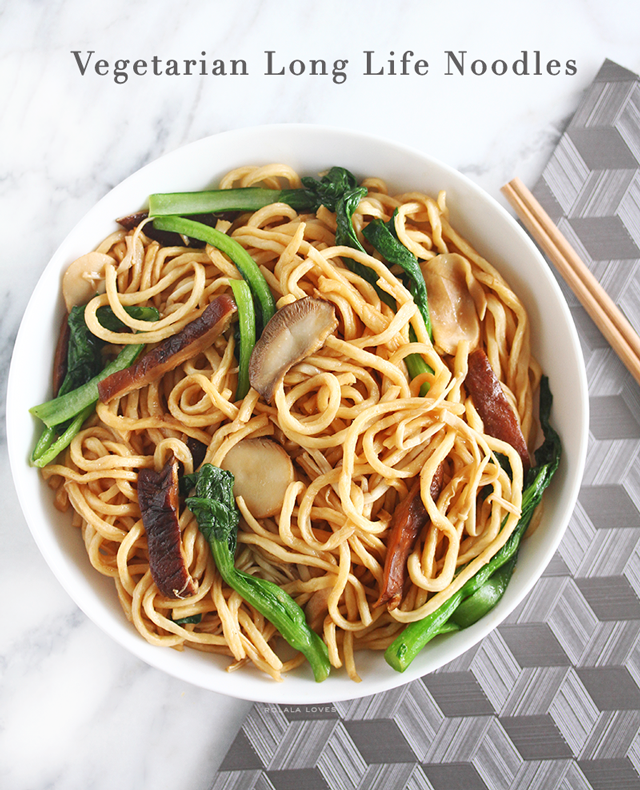 Pour the sauce mixture over the noodles and stir continuously until the sauce is evenly distributed in the noodles. 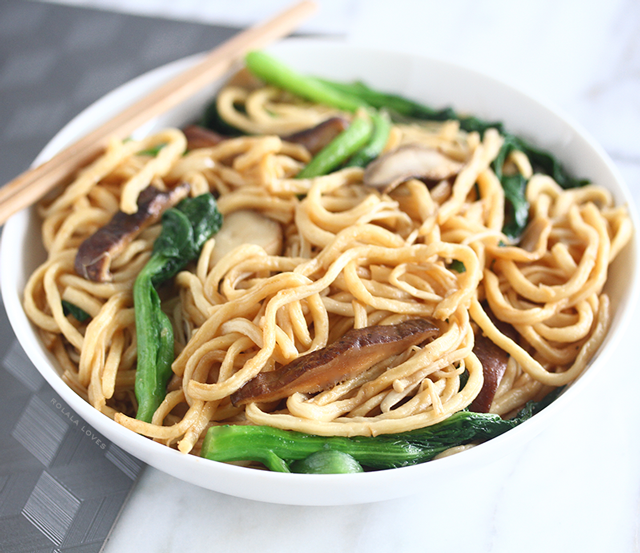 Lower heat, add the mushrooms and vegetables and gently toss into the noodles until fully integrated. If you try this recipe, be sure to let me know how it turned out and how you like it! This looks so delicious and easy to make need to definitely try it out. i freakin love eating oodles! Yay! Finally the recipe and thank you so much, Rowena. I will give this a try and let you know how it goes. Ever since I tried a similar dish a while ago I am hooked and order them whenever I get the chance. It seems fairly easy to make yourself, based on your recipe, so I might give it a go. I haven't noodles in so long! This looks delicious! Happy Monday Rowena! It sounds so good it makes my mouth watering, Rowena, I am a great noodle/pasta lover anyway. Happy new week, girl. This looks quite delish, but I actually don't eat noodles very much. But there are many noodle only places popping up all over. Oh my gosh! This looks so freaking delicious, Rowena! Thanks for sharing the recipe. Although I've cut down on my carbs, I might just make an exception for this:D My hubby and DD loves this type of noodles for sure. Oh wow, this looks so delicious! I'm definitely going to try this recipe! Thanks for sharing! When you do visit the Philippines, or one time when I meet you maybe ... let's go eat out at noodle places hahaha! I think we'll have so much fun! Oh man, this looks GOOD!! And easy, I want to try this for sure, thanks for the recipe. Mmmm this looks so delicious! I know from your blog that noodles symbolize good fortune in Chinese traditions. I don't remember the last time I had noodles and I am not vegetarian but I think I'd love this recipe. Thank you for sharing it with us, Rowena! Have a great day ahead! I love all the ingredients Rowena, so I will definitely have to try this recipe. I know the story behind long life noodles. This looks so delicious and so easy to make. I will try this at home. I'm such a huge mushroom lover. Thanks for sharing. Oh this looks super yummy! Looks really good. My husband is a big noodle fan I can imagine him loving this. 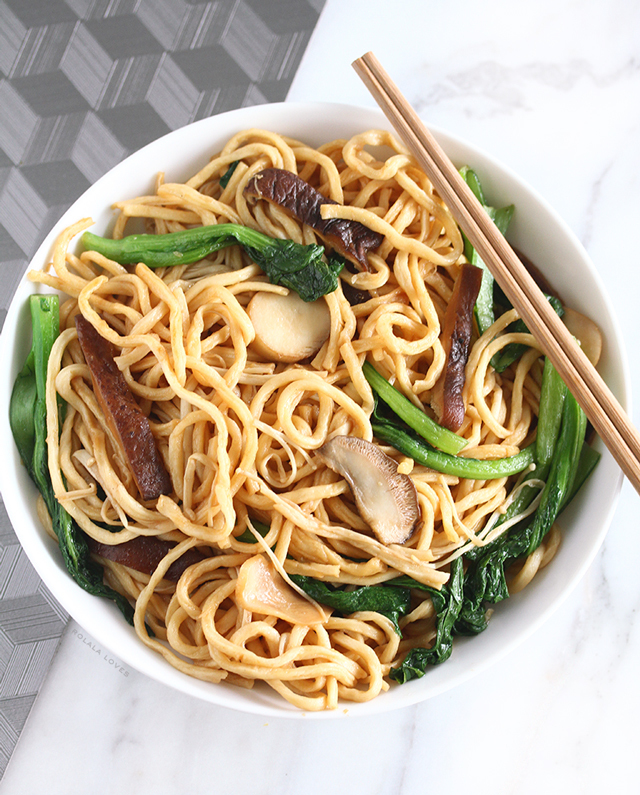 I will try this recipe because it looks yummy....and because I love noodles and mushrooms so it seems like a win-win dish. Mmmm I love yee mein and I always make it in soup, but I haven't try stir-frying them. I will try this recipe Rowena! Thanks for sharing.